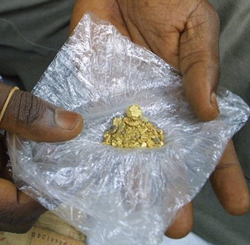 MUTARE: Zimbabwe could be losing thousands of dollars through the smuggling of gold into neighboring Mozambique by small scale miners who have opted to sell their produce in the black market which has ready cash. This follows the current cash crisis which has seen local banking institutions limiting cash withdrawal by depositors. The cash crunch has forced small scale miners who are desperate for ready cash to snub Fidelity Printers and Refinery, a subsidiary of the Reserve Bank of Zimbabwe (RBZ). Miners said despite assurances from the central bank they would get their dues, most banks have reduced withdrawal limits as they try to grapple with the situation. The crisis which initially hit smaller banks but has spread to bigger financial institutions, has been blamed on increasing demand for cash as well as reluctance by Zimbabweans to use plastic money. Speaking at a stakeholders meeting which was convened by Manicaland Miners Association (MMA) recently, small scale miners voiced their concerns over cash shortages at the Fidelity Refinery. They said they were being forced to sell their gold through the black market, mainly Mozambique to raise money to pay their suppliers. â€œIt does not make sense that I sell gold worth $10,000 to RBZ and I cannot access that money. Itâ€™s better to channel another portion to the black market so that I can get hard cash to cover other operational costs at the mine,â€ said one miner who said he was hard-pressed for cash as he had wages to pay to his workers. Another miner from Penhalonga said government has to address the issue of cash shortages as this has impacted negatively on production. â€œThe black market buyers are coming here with cash and we are forced by the situation to clandestinely remove some gold and sell to them. Government must address this crisis as soon as possible,â€ said the miner. Ministry of Mines Provincial Mining Director for Manicaland, Christopher Dube, said the matter was being addressed so that miners could access their cash on time. He told the miners that it was illegal to sell gold to the black market. â€œWe know itâ€™s a challenge and something must be done to address the matter so that you can pay your suppliers,â€ said Dube. MAA chairman, Lovemore Kasha, also confirmed that their members were facing challenges and urged the RBZ to address the situation. Imports, which have skyrocketed against the backdrop of shrinking exports, are also to blame for the cash crisis.